I can't even begin to tell you how much I loved and enjoyed this book. This book goes right up there with The Help and Guernsey Literary and Potato Peel Pie Society. I started reading it at work and could not put it down. I finished it in a 7 hr span. 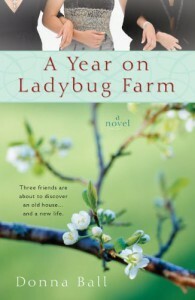 A Year on Ladybug Farm is about 3 close women who decide it's time to put their dreams to the test. 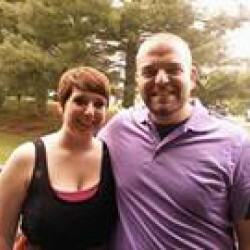 They pool their money and resources together and buy a decrepit old house that they fell in love with. With the house comes not only a deep lover for the house and land but a whole batch of problems as well. As each woman faces their own desire to fix up the house and their reasons for loving it, they also face the reasons why the change was so important. Together, the women continue to find surprising and often costly reasons to stay on the farm. What I loved: It's so strange that I read this book the same time I was having a future breakdown. (You know, where you have a meltdown based on the fact that you have no clue what you're going to do with your future?!) I have been spending a lot of time thinking about how much I would just like to go to a small southern town, buy a little house with a front porch, make fresh lemonade and sit on the swing until the cicadas talk. This book appeals to every one of those notions. It was so realistically written that it makes me feel like I can make my dreams come true if I really wanted it. The women all reminded me of either myself or or of people I know. Their friendship is realistic and so crazy awesome it makes me want the type of friendships they have. What I didn't love: I don't have much to complain about but I guess at some points the book can get a bit too "feel good" and it all works out for the best predictably. The women are flawed..but I can see where some people might think they aren't flawed quite enough. They do seem oddly gifted, smart and almost perfect. But I forgive them since they really do seem so amazing. Grade: I give A Year on Ladybug Farm by Donna Ball an A because the book was really awesome and I recommend it to anyone who has felt like they want a fresh start in their life.